Looking to rent concrete forms and purchase S-Panel ties by Symons in Rochester NY, Ithaca NY and Western New York? +A Reputation for exceptional customer service and expert concrete forming advice. The Duke Company offers CAD (computer aided design) assistance for concrete forming projects, prompt delivery and convenient drive-thru pick-up. We proudly carry the largest selection of ties, including S-Panel ties in Western New York. The widely respected S-Panel Tie, also known as the wire tie, is renown for being the most used tie for both commercial and industrial structures. The Duke Company supply division carries the standard 1 inch break back S Panel tie, and we are able to provide additional sizes. 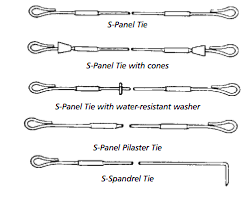 We are able to special order S-Panel ties in any length and with essential options including cones and water resistant washers.